There has been hardly been a time in sports where I have feared an uncertain outcome. Surely I was afraid of my first Ironman, but not on a physical level. I knew if it came down to it, I could walk a marathon if I had to. This past week, I was faced with something unknown: I would be racing two full Ironman distance races spread out by 7 days and I had picked one of the hardest courses on the Ironman circuit as a second race – Ironman Bolton/UK. I made a video about Triathlon Vitoria already (see it here) so I will cut straight to IM UK news. On the week between both races, I did very little: 3 runs, 3 rides, 3 swims, all very easy. My legs felt recovered by day 5 and I was excited for the race. I guess excitement itself would have masked any soreness I may have had. It never seems to amaze me the power of a positive mindset. The Pro field in the UK was short, but quite strong. There weren’t many racers on the start list, but the quality of the field was quite high. Having previewed the course the day before, I knew it was brutal and the rain would make the surface very slick. I found the QR PRsix handling to be quite good compared to other TT bikes and having normal brakes on it (read, not aero or fancy ones) gives me enough confidence to handle any technical section. I picked the Metron 81SL complete wheelset instead of using a rear disc wheel because I felt more at ease with it on uphill sections. I quickly realized I had made a poor choice of gearing (54/42, 11×23), specially on the rear wheel as a 25 or even 27 at the back would have been more appropriate. As I will report later, I ended up not even being able to use the 23 so had to crawl up all the course with the 21. Most of my fellow competitors went with the disc option, despite the course being quite punchy. 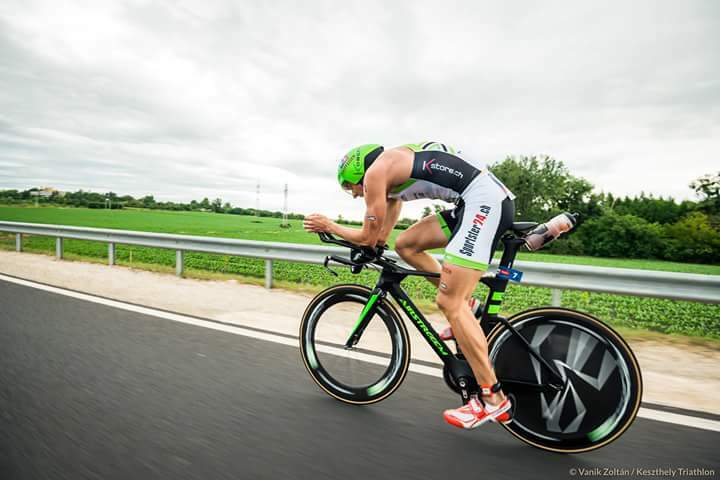 Though my plan – above all – was to be safe and feel confident on my bike, taking little to no risks and getting to T2. Fast forwarding to race action: I had a great start to the swim, considering how many strong swimmers there were in the field. As it happened in Brazil earlier in the year, I started to become uncomfortable when I lost my marked man. The swim is divided into two laps and racers must run through the entire amateur field on the second one, which made it for an interesting surf. Out of T1, the course immediately started climbing, but I felt quite decent. Unfortunately (and luckily afterwards), on one of the few steeper sections I dropped my chain like a rookie and tried to pull it back on as I was still moving. Because this happened on a uphill section, I quickly lost momentum and got my chain jammed and as I did this, my dropout bent. While I was luckily not to crash or completely snap it, the now bent dropout and derailleur made every single gear jump as I rode. There was one gear I could ride on without noise and big jumps so I picked it to do most of the course. The front derailleur still moved properly, but because the rear one was not in alignment, I constantly got the chain dropped. As I rode to T2, I was just praying for the dropout to hold on and my rear derailleur to not touch my spokes. Again, it’s amazing what a positive mindset can do for you. In any other situation, I would probably have packed my bags and headed home. But it was this challenge of two back-to-back Ironmans that kept me pumped. I rode for maybe 85 miles like this, still managing to hold decent power – 228w avg, 249w NP. I came into T2 with a few more minutes lost. Well, let’s be honest, I lost a lot of time on the bike but I was super happy that have made it. As I got out of T2, I think I was either 11th or 12th place and the question would be how long before fatigue catches up. Surprisingly I felt quite good maybe due to the “easier” ride I was obligated to and even began to catch back with a few guys ahead. The run course in Bolton is anything but flat, but felt relatively fast. It’s a long drag up a hill on the way out and a quad-screamer on the way back, and it felt like a pleasant run until about half way point when my head gave up a bit. When my brain realized I wouldn’t claw back my way any further in the field, the body just followed. I also had two quick restroom stops drop weight, but it wasn’t enough to run faster. Still, I was able to finish 6th (8th overall), enough to claim the last paycheck of the day. Overall, this was a humbling experience. Truth is I never felt great, I just didn’t have that extra speed and Bolton’s race felt like a very long day. The race itself is slow to begin with so it would always feel a little longer than normal. My main fear was that I would get injured or body would completely fail, but again, a positive mind and a bit of luck with equipment in this case kept me going. It was humbling though because I felt unprepared for such hilly courses – I don’t know how to race them properly. I end up wasting energy, struggling to find a good rhythm and just paced poorly. It also seems I lacked a bit of run mileage this year, which is odd since I have been healthy. I guess due to life circumstances (and weather! ), I haven’t been able to put enough under my belt which I clearly paid for on both marathons logging my two slowest times in recent years. The good news is these are things I can still work on this year and I got a good amount of running this last 8 days! The plan is to do Ironman Maastricht on Aug 6, but let’s see how body recovers!